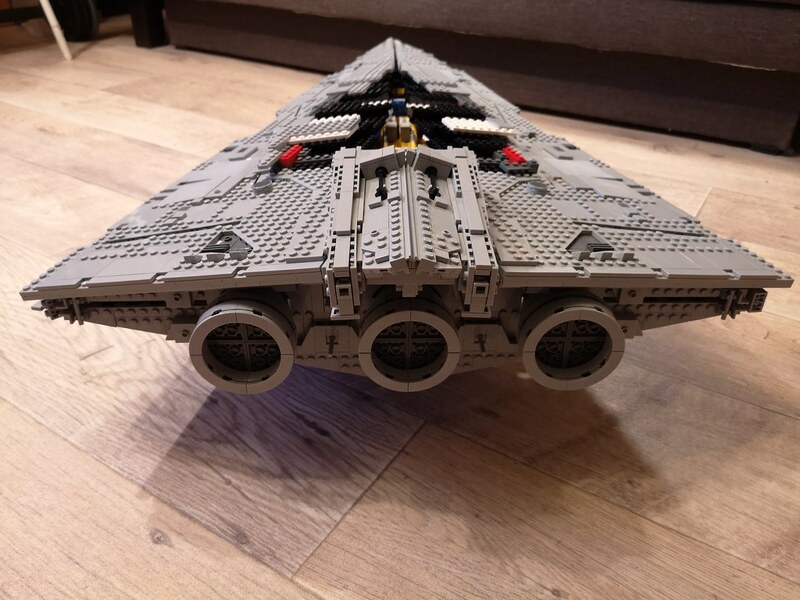 I wanna share with you my new project - a First Order Resurgent-class Star Destroyer in UCS-scale. To avoid another long time MOC in WIP Nirvana I started this time with little help from LDD. Dimensions, main frame, angles... took me about a year to set these parts. Because of the LDD file I generated instructions and and part lists for me. 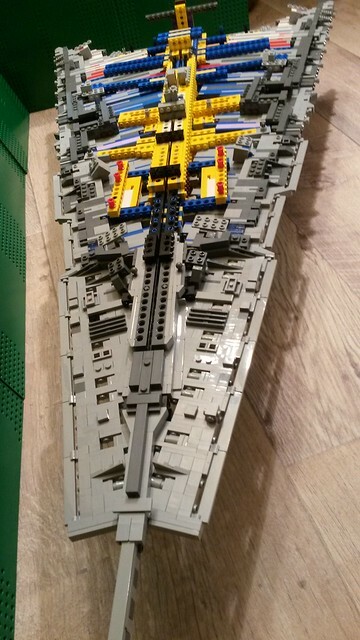 On the picture you can see an early version of the ship and one of the latest with much more details. For the moment only one digital render of the ship. There will be some adjustments/tweaks in the "real" version but most of it works fine for me. I already finished the main frame with the instructions... and its good! I like it very much! Looking forward to more pictures. 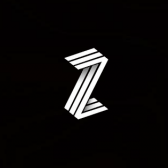 Great design sir, well done. well done. what are the dimensions? It's coming out really good. Are you planning to release the LDD/instruction files when you complete the model? Looks great! Also good work on updating the models, the second one looks much better then the first one, the tiles give it a nice finished look! Thank you for the positiv feedback folks! 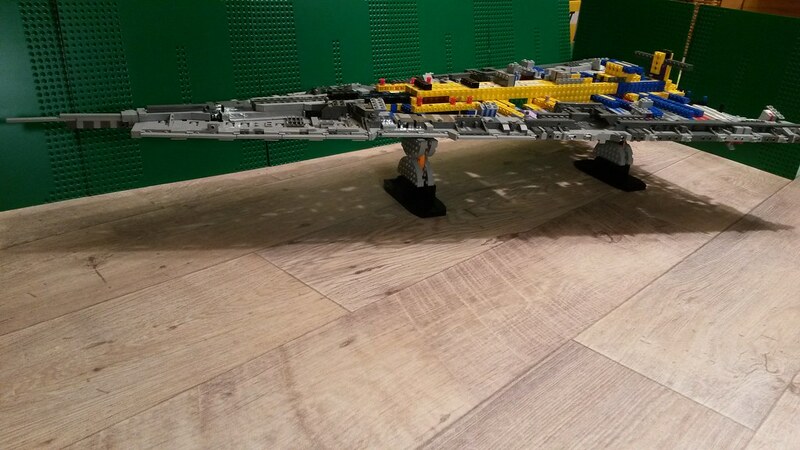 Around 7900 bricks at version 2.06. But some parts are missing. 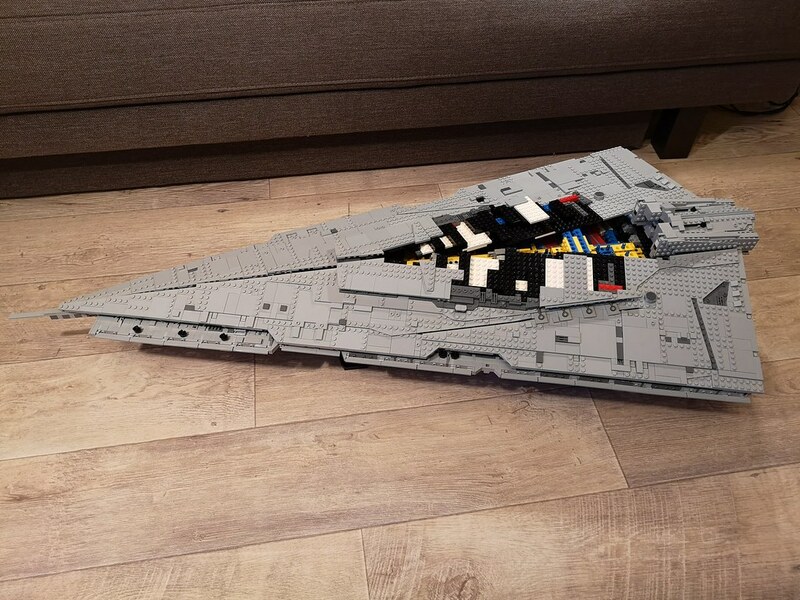 So the final MOC should have 9000 pieces. Not final numbers here as well but ~ 90cm x 40cm x 30cm. I`m pretty sure I can do this. Here are the first shots of my WIP with Legos. Everything looks fine so far but some elements will be changed during the building process. It already reaches a length of 1 meter. The next step will be the engine section. Just waiting for the next wave of parts and some free time to spent it. Wow, awesome can’t wait to see more the detailing is fantastic! Wow That is going to be a beast. 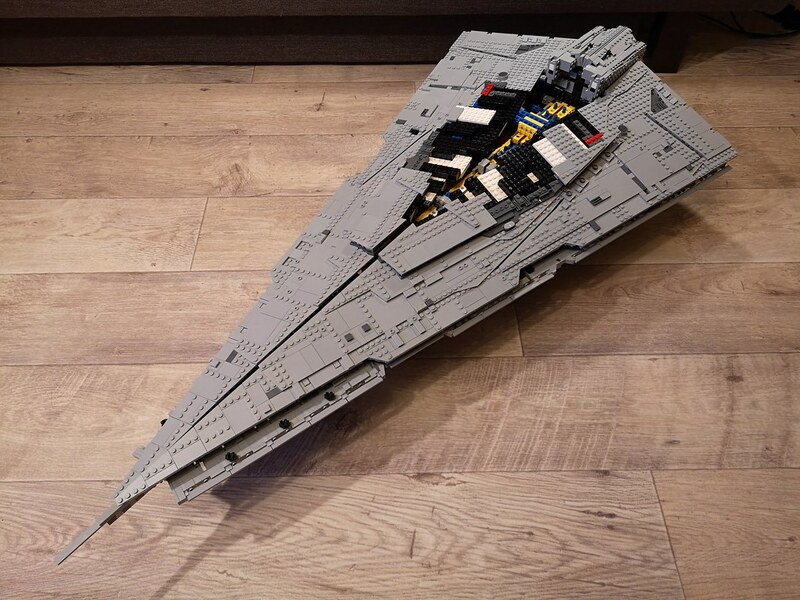 That Resurgent is incredible, its the best and most accurate one I've seen so far and I want one, will you make instructions for it once you have finished? 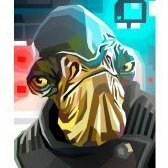 I would love to see someone make The MC85 Raddus in the same size to compare. When this ship is complete in real life I guess I reverse engineer it for a good instruction. I already thought about the Raddus in same scale as my Resurgent SD. But first things first... The Resurgent isnt finished yet and my focus should be on this beauty. 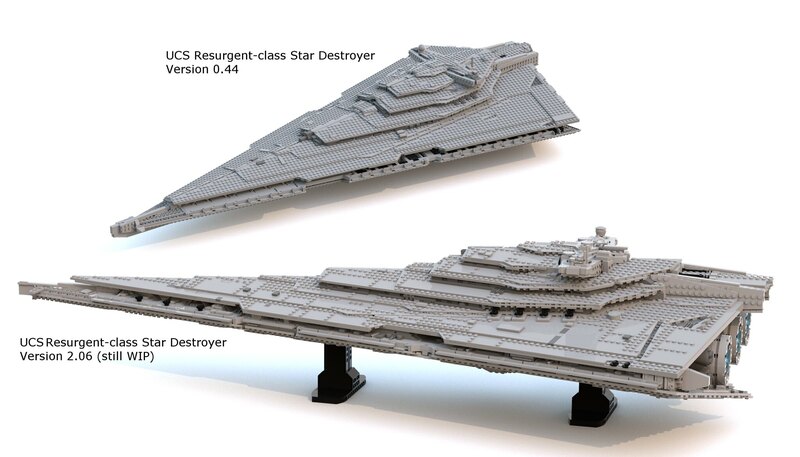 I know that the Resurgent is 2.9k in cannon, and the Raddus is 3.4k, which means it would be bigger, would you do then size accurate version to each other or would you scale it down? 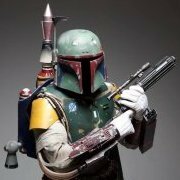 Next building marathon starts next week. 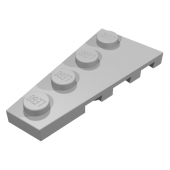 Just have to make some orders at Bricklink. The ship´s final size will be around 1 meter in length, 0.4 meters width. 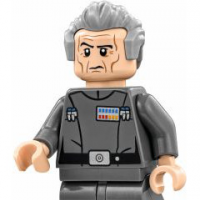 The title of UCS is inadequate for your resurgent class, that's how good it is. The past days I continued my building progress with the engine and the upper plating. Also the dome at the underside which I guess you can only barely see on the pictures. Meanwhile the silhouette approachs the shape of the battlecruiser and its better then I thought. 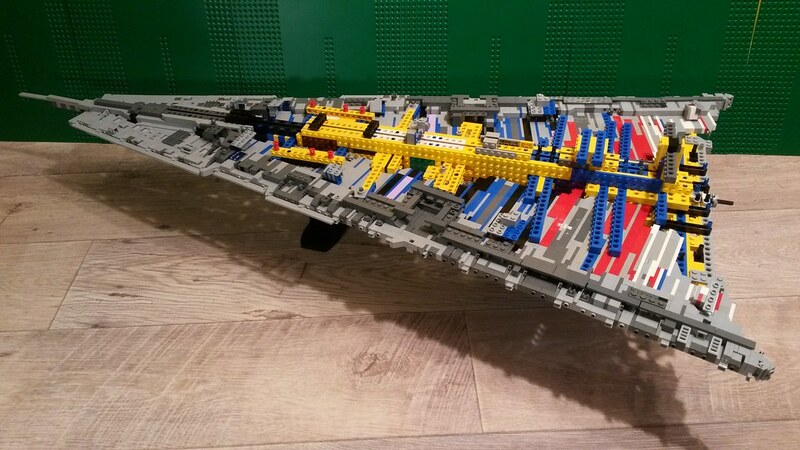 I changed some details on the plating and started the superstructure on top as well. This part will be done during in next update. And dont worry the gaps will be fixed and also the details are not final. HERE you can find some more pictures! She's looking really good and sleek, can't wait to see it done, also how does the underside look? Very nice. Keep going and you might be the one that makes me like this destroyer design :D So far I wasn't overly impressed (movie, pictures) but I totally love your build! I noticed the sleekness really looks better than expected and will be adjusted a bit more. The underside is similar to the upper plating. It also will be upgraded to make it smooth. Thanks... I am pretty sure the end result will change your mind of this beauty! Really cool! This is going to be awesome when complete. Any new progress that you have done recently?